Here on our little Cultivating Home homestead, we've been having a busy spring. With the acquisition of a tractor and the ability to plow and furrow the earth, we've expanded the size of our veggie gardens to four times what we've had in our raised beds in previous years. Can anyone say, "hello, weeding"? Sean's prepared all the gardens and took over the potato planting while I tackled the remainder of the planting and daily morning and evening water and weeding. 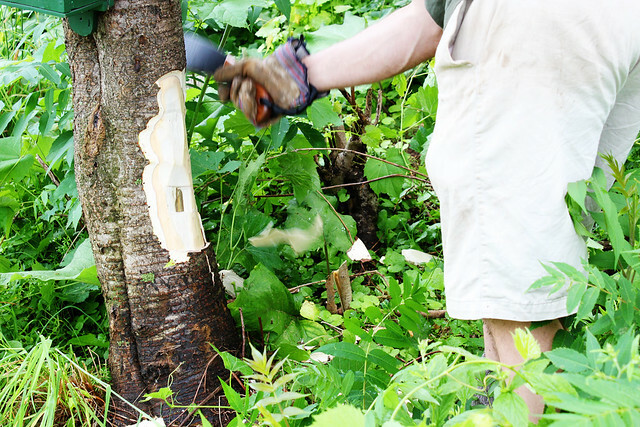 This afternoon Sean is sharpening his chain saw, getting ready to work on our winter wood, but more on that later. We have a few trees (junk trees Sean calls them) taking up space and light in the yard from the garden and fruit trees. We aren't keen on just cutting down trees for no reason and have planted an additional 23 trees plus shrubs on our homestead this spring alone. 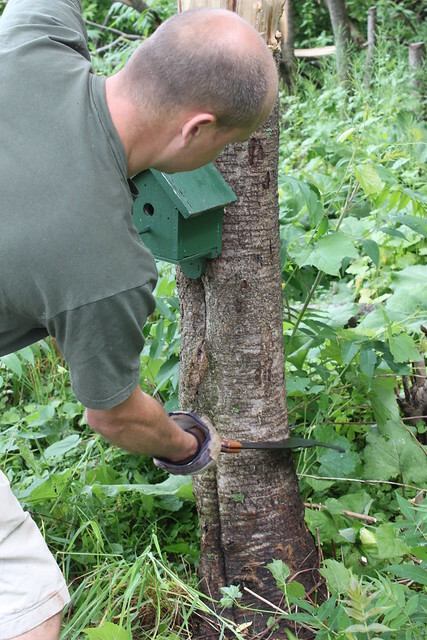 Sean had read about girdling trees as a method of drying trees out before cutting them down, and this is the method we've been using. 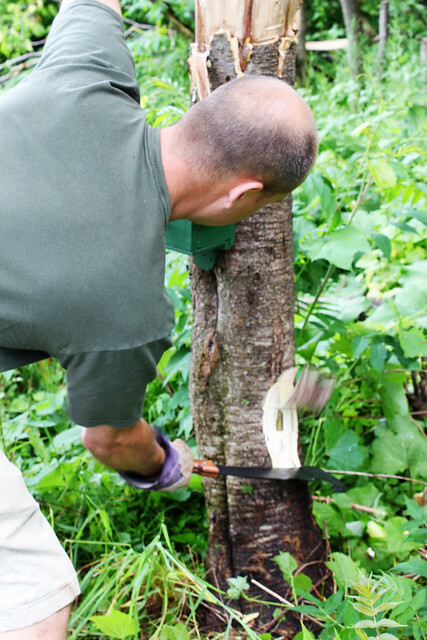 Sean used our Woodman's Pal from Protoolindustries.net to clear out the weeds and growth around the tree he is removing. 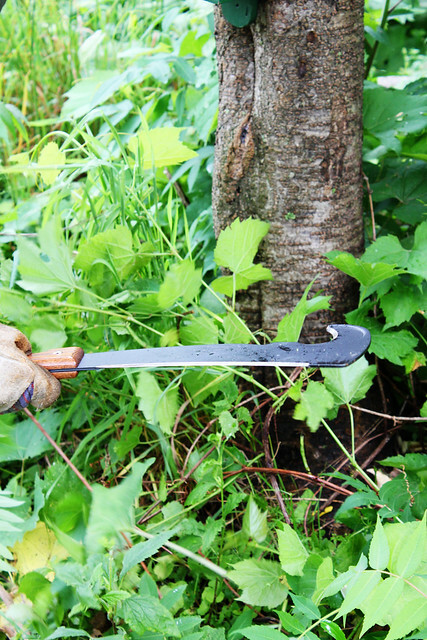 The Woodsman's Pal has a curved knife hook that pulls anything out and is nice because it catches right around the weeds and small trees at their base. It worked great for this! We've used it to cut out a lot of unwanted wild grape vines at the back of our property too. 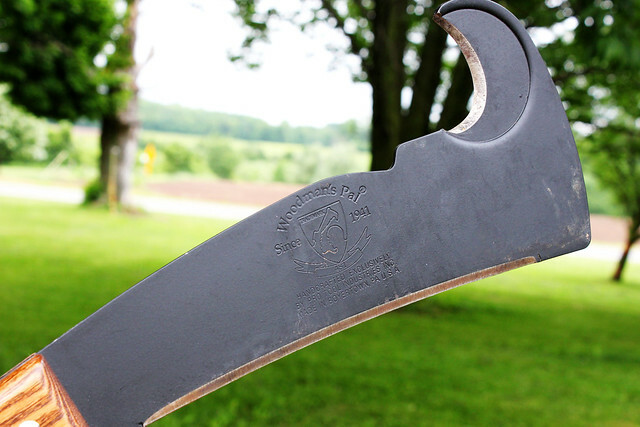 The Woodsman's Pal is a great homesteading tool because it has a long sharp edge and then the curved hooded edge on the opposite side. Sean has really enjoyed using it. A few months ago he pointed it out to me online as an item he thought would be useful. I think it will also be handy come butchering time this Autumn. Since "Made in America" is very important to us, and so very, very important to our nations survival, I appreciate that it is made just a few hours away from our home. It is 16 1/2 inches long (Sean found himself wishing it were slightly longer) and has a beautiful hardwood handle. We have the Woodsman's Pal Classic and I noticed the Military version has a leather grip, which I'm guessing would have a better grip - not as sleek and smooth as the hardwood. The hardwood handle is easy and comfortable to hold, however. 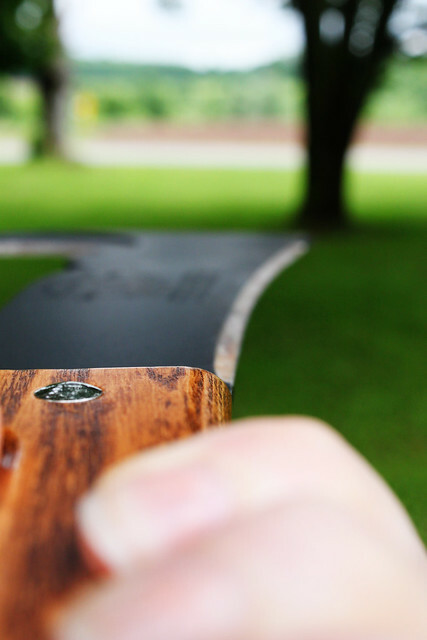 The blade is carbon steel and keeps it's edge, which means you won't be running to sharpen it each time you use it. Sean has used his chainsaw file to sharpen the curved edge. The mama in me also likes that the Woodman's Pal comes with a sheath that it cannot slip out of. 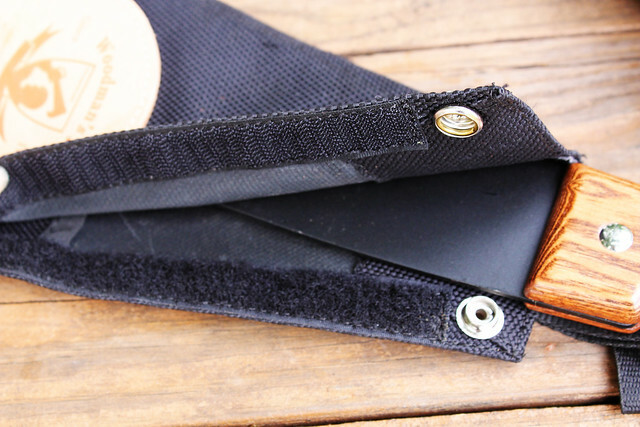 It has heavy duty snaps and velcro holding it in place. I was excited to get this post up before Father's Day because I know a lot of our readers are homesteading families or country families like us. 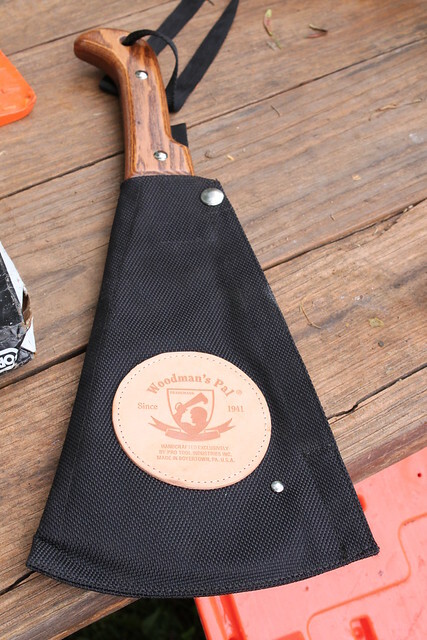 I think this is a great investment and would also make a great Father's Day gift for husband's who love the outdoors. Good tools are worth their weight in gold. Fine Print: Pro Tool Industries sent me the Woodsman's pal to review. Our use and review of this product was not influenced in any way and I was under no obligation to give a positive review. If you have a product you would like to see reviewed on Cultivating Home, you can contact us at the link at the top of the page.